Each year, Missouri Fox Trotting Horse owners, exhibitors and admirers from around the world travel to the MFTHBA World Headquarters and Showgrounds in Ava, Missouri, to attend the Missouri Fox Trotting Horse Show and Celebration. Originally named the Missouri Fox Trotting Horse Jubilee Celebration, this event was first held in 1959 and consisted of a one-day show with 14 classes. Today, the Missouri Fox Trotting Horse Show and Celebration has grown to reflect the versatility of the breed: It now takes place over the course of a week and features more than 130 classes. Missouri Fox Trotters compete in a variety of classes with the hope of carrying a garland and being awarded the title of World Grand Champion. Competition includes performance classes, model, ranch horse competition and versatility classes. While the highlight of the Celebration is the World Grand Championship show, this annual gathering of Missouri Fox Trotter enthusiasts is truly about celebrating the breed. 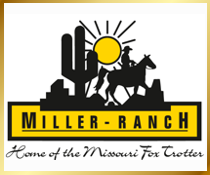 Throughout the week, attendees can participate in organized trail rides, ranch sorting events, practice at the Fox Trot Playground, shop for Missouri Fox Trotter-related merchandise, and so much more. We invite you to join us in celebrating the Missouri Fox Trotting Horse at our annual Show and Celebration.